One of the many things that makes the Triple Crown so great is that each race is so different. That means that handicappers have to adjust as much as the horses do if they want to succeed from race to race. The Kentucky Derby features a ridiculously large field over the longest distance the horses have ever run. Distance and field size are less of a factor in the Preakness, but now the top horses have to run on just two weeks rest -- likely for the first time. In the Belmont horses have to stretch out to a marathon distance, and do it over the longest track in the country. Distance - A mile and a half is a very long race for these horses. Three year olds are not fully mature horses, so asking them to run a marathon distance is a big test, and a lot of horses just aren’t up to it. Before you bet on any horse in this race you have to be confident he will still be on four feet and moving forward at the end. There are two basic ways to quickly gain that confidence. First, is he bred to run a long way? Pedigree analysis is complex and beyond most people, but there is a quick short cut -- if the sire or damsire won a Triple Crown race, a Breeders’ Cup race that wasn’t at a spring distance, or another major race then the horse is probably reasonably ready for the challenge. Second, how has he finished in his longest races? If the horses has been gaining ground at the end of races then he was likely fresher than other horses, and that’s a good sign. If he was just barely holding on or even losing ground, though, then he could be in real trouble when the race gets longer. Jockey experience - The Belmont track is a mile and a half long. Most other major tracks are a mile long. Basic geometry skills will tell you that a longer oval will have longer turns and longer stretches. If a jockey doesn’t know the track well then he can make the critical error of making his move where he would on any other track. If the horse moves around the final turn he finds himself with a much longer stretch than normal to deal with and he can burn out badly. It doesn’t matter how good a jockey is -- if he doesn’t know the track he is a liability. Calvin Borel is a perfect example of this. In 2009 he had won the Derby and the Preakness and was looking to complete the personal Triple Crown aboard Mine That Bird. He didn’t know the track, but made the terrible decision not to ride in any races the days before the Belmont. He made a horribly timed move in the Belmont and gave his horse no chance of success. He was the hottest jockey on the planet, but the track didn’t care. 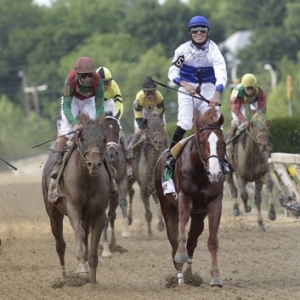 Doc’s Sports will release our expert Belmont Stakes picks for the third leg of the Triple Crown on Saturday, June 11. You can purchase our full Belmont package for just $20. You will get Doc’s win-place-show bets plus a variety of exotics for one low price, and if we don’t show you a profit then our next batch of horse racing picks come free of charge. Doc is an expert against the Belmont odds and he has been putting in lots of extra time on this race and thinks there will be some big profits on Saturday.